ET-SWA100 Early Warning Software monitors projectors connected to an intranet and informs you when an abnormality is detected or predicted, and when there are symptoms of trouble. 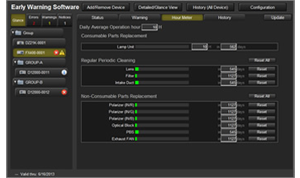 It can also record the operating conditions of each projector and, based on the operating hours, it can predict* and tell you approximately when consumable parts will be required, regular periodic cleaning will be necessary, and non-consumable parts will need to be replaced. * To download/activate the software, please visit the above website. * Please note that the software does not guarantee the prediction of all device breakdowns in all instances. The ET-SWA100 monitor screen displays items such as the projector status and maintenance schedule in a gauge format. This makes it easy to understand at a glance. Projectors can also be displayed by group in a list format, to simplify the monitoring and management of multiple units. You can also check the status of projectors monitored by ET-SWA100 Early Warning Software through a web browser. Without having to physically go to the monitoring server, you can check the projector status from your PC or tablet. Also, if a VPN (Virtual Private Network) is configured, monitoring is possible from outside the intranet. You can easily check the projector status from a remote location, greatly speeding up troubleshooting. Furthermore, you can link from the Early Warning Software monitoring screen to a web browser control screen to manage each projector remotely. This allows extremely smooth operation of various operations, from checking the projector's status to actually operating the projector. When ET-SWA100 Early Warning Software detects or predicts a failure,* an e-mail notification is automatically sent to a predetermined e-mail address using SMTP protocol. SNMP protocol can also be used to notify an SNMP Manager application. It can also be linked to existing monitoring software to back-up comprehensive system administration. Refer to the list to see whether your projector model is compatible with ET-SWA100 Early Warning Software. The computer that will be used as a monitoring server and where the software will be installed must meet the following requirements. * The software works in 32-bit mode on 64-bit Windows®. * Compatible with the English and Japanese language versions of the above operating systems. * Microsoft Internet Information Services (IIS) is automatically enabled when the software is installed. * If not installed, download and install it from Microsoft's web site. * Excludes the Modern UI Internet Explorer 10 provided with Windows® 8. CPU Intel® Core™ 2 Duo or higher processor or equivalent processor installed. * Intel® Core™ i5 or higher recommended when 65 or more devices are connected. * Required capacity increases with increasing number of units. Others One of the following adapters must be installed and running properly. Display resolution shall be 1,024 x 768 or higher, and the number of colors on the screen must be more than High Color (16 bit) or higher. A web browser is used to log on to the monitoring server and view the monitoring screen. With a LAN function and any of the web browsers listed below, a tablet can also be used for access. Windows Use any of the following web browsers. Please visit PASS to download and activate ET-SWA100 Early Warning Software. 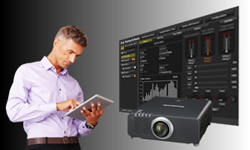 A free, 90-day trial version for monitoring up to four projectors is available. Note: Please contact your sales representative for more details on the ET-SWA100. 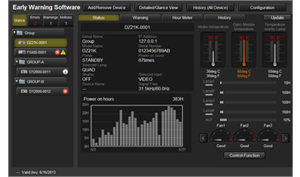 * The free, 90-day trial version lets you connect and monitor up to 2048 units (projectors and displays). ** A renewal license key must be purchased each year.